Specific endurance is the ultimate ability for race fitness. You could have a large aerobic capacity and tremendous speed – and yet – you would still fall short of your potential if you’re lacking the specific endurance for your event. But that doesn’t mean you can dismiss your general endurance or general speed. In this article, you will learn how to progress your training in a logical manner. There are essentially 3 types of running fitness. Speed, endurance and specific endurance. Few runners are well balanced between all 3. First off, natural ability skews runners either towards endurance or speed. Secondly, the type of training a runner has emphasized over the years weighs in. Specific endurance, by contrast, is an ability built upon speed and endurance. It is little more than the icing of a cake. Speed for long-distance runners can be defined for all intensities that exceed 100% of VO2max, which means faster than 3000m race pace. The benefit we are looking for as distance runners is neuromuscular recruitment; strengthening the brain-muscle connection. When you have acquired a solid general speed then your important VO2max intervals (3K to 10K pace) will become more manageable. Endurance, on the other hand, is primarily the ability to use oxygen at a high rate coupled with enlarged glycogen stores in your working muscles and liver. 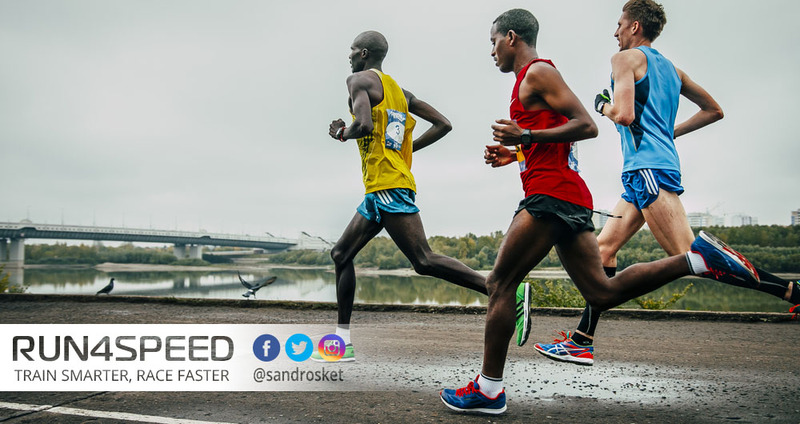 In shorter races, such as the 5K and 10K, VO2max is more important than in longer races, where the emphasis shifts slightly towards an efficient and lasting fuel supply. Generally, you lack endurance when you perform better in shorter races. Specific endurance is nothing more than a goal-specific blend of speed and endurance. Therefore, by definition, it is built upon those 2 general abilities. But that also means that speed and endurance by itself cannot be applied on race day if you haven’t been training at race-specific intensities for your event. In the next few paragraphs, I will show you exactly how to go about it. You can’t train speed, endurance, and specific endurance all at the same time. That’s an overkill that would quickly sideline you with injury and burnout. But endurance can be coupled with either speed or specific endurance. Though, specific endurance, as we have learned, can only be trained to its maximum after a solid base of speed and endurance have been established. ‘Twin-Base’ is what I call the first focus block (mesocycle) of my training programs. On the speed side, there is an emphasis on general speed + anaerobic support and on the endurance side there general endurance and aerobic support. (The exact pace will depend on your race distance.) In other words, first you work on the opposite ends of the spectrum of running fitness – a polarization of intensities. The next phase I call ‘Max-Conditioning’. That means, once a solid base of endurance and speed in your legs, you move on to train direct endurance support (10K to marathon paced cruise intervals or tempos) and direct speed support (3K to 10K paced VO2max intervals). For 5K and 10K athletes the faster end is applicable, for half-marathoners and marathoners the slower (but longer) end. Three to six weeks out of your race we move into the final phase, which I like to call ‘Race-Specific’, often also referred to as sharpening. Here is where you develop your specific endurance (target race pace) to its temporary maximum. In other words: Train as much at your target race pace as feasible. Bear in mind that this is the most stressful phase of training and a peak can only be held for a few weeks. The key takeaway of this article: Train with a periodization model. (The one I have outlined here is a non-linear periodization.) Now that doesn’t mean you will have to overhaul your entire training structure that you have come to hold dear over the years. But you do want to tweak your workouts in a logical, progressive way that ensures your best time on race day, whether that’s a 5K or a marathon.